I should be sleeping now, but it can wait. It can wait, because in fifteen minutes another Veterans Day will have come and gone. I couldn't let it go before I have said this one last thing. Four years ago I told you the story of a young Marine from Michigan, who lost his life in the Iraqi Province of Anbar. His name was Nicholas Manoukian, and he was 22 years old. Nicholas Manoukian is one of over four thousand Americans and untold hundreds of thousands of Iraqis who have been killed in Iraq since the U.S. invasion, but this post isn't about any of that, this is just a time to remember good young fellow, who was a dedicated Marine, husband, father, and son. A couple of weeks after I posted about it, I was contacted by Manoukian's mother, Mary, who had read the post. Mary and I stayed in touch for a while, and she was good enough to tell me about her son. Nick was born on August 31st, 1984, and was adopted at one year of age by Mary and Isaac Manoukian, of Lathrup Village, Michigan. Nick was the light of his parent's eyes. The Manoukians were a close family, and Nick and Mary drew closer still when Isaac died when Nick was only 12 years old. When Nick was 14 and in Junior High School he met a girl named Danielle. By the time Nick was 15, he and Danielle were an item. Although they would drift apart, later, their meeting would be very important to them later in life. Nick was interested in many things, including playing the drums, writing poetry, hockey, snowboarding, art and cooking. Nick was also, according to his mom, a great hugger! When Nick would see his mother, he would give her big, rib-crushing hugs. Nick Graduated from Royal Oak Kimball High School, in 2003, and spent some time in college studying art before he joined the Marine Corps in 2004, sometime in this period, he and Danielle rekindled thei r relationship. 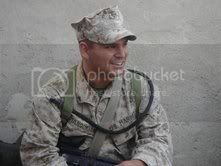 Corporal Manoukian deployed to Iraq the first time in March of 2005, and was involved in the second Battle of Fallujah. Nick survived this deployment, but his unit, the first battalion, 6th Marine regiment was slated to deploy to Iraq again in September of 2006. Before going back to Iraq, Nicholas had some things to do, so in July of 2006, he went back to Michigan on leave and married Danielle! After a too-short period, Nicholas was back with his unit, which deployed to Anbar province in September of 2006. Manoukian had only been back in Iraq for a month when he was killed. His Humvee was stuck by a roadside bomb, while his unit was conducting combat operations. Manoukian left behind his wife, mother, stepson, and as near as I can tell, a large number of loving friends. This good young man lost his life doing his duty. Four years ago, I promised Manoukian's mother, Mary, that I wouldn't forget her son. I haven't. I won't. To tell you the truth, I don't really know any more about Nick Manoukian than I did four years ago, but that isn't what is important here. I made a promise to Mary, and if writing this little bit about her son every year helps one person remember him, well, that's the least I can do. Great. Thanks for saying "thank you". For all of your thanks my knees still hurt, so does my shoulder and my back. So do the injuries of countless other veterans. You're welcome to for my pain. Really. While you pat yourself on the back today, feeling good about yourselves for thanking the veterans that you see during the day, remember this: Thousands of veterans are homeless. Thousands of veterans need medical care for injuries or wounds that they sustained while serving, and won't get it from Uncle Sam. You might want to remember those things... and after you say "Happy Veterans Day" to the veterans that you know... call your Congressional Representatives, and tell them that they MUST do a better job. On November 10th, 1775, the Continental Congress of the fledgling nation that would become the United States, authorized two battalions of Marines to serve our fleet during the American Revolution. We Marines consider this date the "birthday" of our Corps. Beginning with a recruitment drive at Tun Tavern, in Philadelphia, Captain Samuel Nicholas, our first commandant began filling our ranks with most dedicated men (and later, women) this country has produced, from his time to ours. Today is a day that Marines old and new, young and old, greet each other with handshakes and a hearty "Happy Birthday, Marine!"... it is a day where we tell old stories from places that we served, and people that we served with. It is a day of joy, as much as it is a day of sadness. Whenever Marines get together and tell their stories, we remember our whole history and our record of combat service to our nation, from Providence, The Bahamas to Chapultepec castle; from Tripoli to Haiti; From Iwo Jima to Khe Sahn; and from Grenada to Fallujah. In our stories we remember our heroes... famous men like John Basilone, Chesty Puller, Dan Daly, and Smedley Butler, as well as men most of you have never heard of, like Nicholas Manoukian, who is pictured here, and remembered here. Those fallen Marines are our brothers, every bit as much as all Marines are brothers (and sisters). So, today, while I go about my business, and greet the many old Marines that I work with, and those I meet in the course of the day, I will remember our history, take pride in our accomplishments and dedication to service... and I will remember, solemnly, the sacrifices made by so many that have gone before. It is nearly impossible to live where I live and not see and extraordinary number of military personnel. Living in such close proximity to the Pentagon, Fort Meyer, Henderson Hall, The NAvy Annex, Marine Corps Base Quantico, and Fort Belvoir (among many others), you can't help but see folks of all of the armed forces, all of the time. Seeing as many military people as I do, and being a veteran myself, it is easy to spot the differences in military dress uniforms or service uniforms at a glance. The military branches being so different one from the other, you didn't have to think twice about the guy in the white uniform... he was clearly in the Navy. The woman in blue was either Air Force or Coast Guard (and you only needed an extra half-second to figure out which it was). The Marines and the army, despite the fact that they both wear green, are as different as night and day (the army uses a different shade of green than The Corps), the army wearing light green shirts, The Corps' shirts being khaki. Simple, right? Well, maybe not so much. In the early 1980's, most of our armed forces began to adopt camouflage uniforms for use in the field, or in combat. The army started the ball rolling, with the Marine Corps right alongside... then followed the Navy, and thern, God help us, the Air Force. In an effort to keep costs down, the services were all using the same "woodland" pattern material... indeed, all of the services we wearing the same camouflage uniform, the only distinction being the insignia. Well, times have changed a bit. In the early part of the Iraq war (I refuse to call it Operation Iraqi Freedom, because Iraq isn't free, it just has new masters), the Marine Corps adopted a new camouflage pattern. It is a sort of digital print that is very similar to the then-new Canadian armed forces pattern (called Cadpat), the Marine Corps, not to be outdone, calls their pattern Marpat. The United States Army, trying to keep up with the Marine Corps, got rid of the old woodland pattern, and the "chocolate chip" pattern desert uniform, as well as the more recent desert pattern, and came up with their own pattern called "ACU" (Army combat uniform). OK, you know something? I get the whole "let's have a uniform distinctive to our own service" thing. I do. Having different uniforms certainly goes a long way to establishing military identity... being a veteran of the service with the best looking uniforms AND best combat record has taught me that, but I digress. Oh, right. Distinctive uniforms. Anyway, the US Air Force, not wanting to be left behind (not a reference to that Tim LaHaye crap), decided the it, too, needed a distinctive camouflage pattern. So, what they did was.... What? What did you say? Did you say "Why in the world does that Air Force need a camouflage uniform?" Is that what you said? Well, fair enough... you know that I like to answer questions when my readers have them. I'll take a whack at it, ok? Some (albeit very few) members of the Air Force have very good reasons to wear camouflage. For instance, Combat Air Control teams, and Tactical Air Controllers have every reason in the world to wear such uniforms, as they usually operate with army units and spend their time directing forward air strikes and managing air traffic around the battlefield. These men operate wherever the fighting is. They need whatever protection camouflage can provide. Make sense?, good, here are two more great examples: Air Force Para-rescue operators (also known as PJ's): These men are combat rescue operators. They are inserted by helicopter, sometimes by parachute, often in enemy territory to recuse downed aircrew. it is a hard but honorable job. Camouflage is also needed by Air Force Security Forces: These men and women protect air bases. Most importantly, they protect forward-deployed airbases that are still subject to ground attack, they too need the extra protection (not as much, maybe, but there you are). OK, so the Air Force has some reasons that some of it's personnel should wear camouflage, but this is where it gets sticky and brings me to the point of this post: Most people in the Air Force have no bloody reason to wear camouflage uniforms. I mean, really, I have a neighbor, a lovely young woman, who is a budget analyst for the air national guard, and every time I see her in her freshly starched camouflage uniform (with desert-tan boots) I want to scream. Not that she isn't impeccably turned out (she is), but this is a person who, through her whole career hasn't held a gun, much less gone anywhere near anyone who has fired a shot in anger. I'm not writing this to rag on my neighbor, but do you have any idea how much it costs you and me to pay for this knee-jerk reaction to what appears to be a shift in military fashion? There are even MATERNITY camouflage uniforms for the army and air force. Now, I ask you: What kind of sense does that make?, because try as I might, I can't come up with a good answer.